Things That Bring Back Memories "Lookin' Out My Back Door"
The song “Lookin’ Out My Back Door” is one that was usually on at your friends house when you were hanging out in the garage….or one that you heard at a corner bar, that the band liked to cover. The band has always been asked about a reunion, but it never seemed to be in the cards. 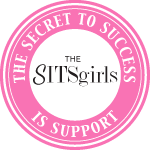 Sometimes in life, you just need to be thankful for what was and make new things, instead of trying to re-create the old, right? “Lookin’ Out My Back Door” is a song recorded by the American band Creedence Clearwater Revival, also known as CCR. The song was written by the band’s lead singer, guitarist, and songwriter, John Fogerty. The song is included on their 1970 album Cosmo’s Factory, the group’s fifth album, which was also their fifth and final No. 2 Billboard hit. It was certified Gold and in the early 1990’s was also certified Platinum. In 2003 Cosmo’s Factory was ranked 265 on Rolling Stone’s list of 500 greatest albums of all time. However, the album signaled the decline and subsequent end for the band. “Lookin’ Out My Back Door” was a direct tribute to the Bakersfield Sound, a form of music that influenced John Fogerty and the Creedence sound. Buck Owens, one of the architects of the Bakersfield Sound, is even mentioned in the song’s lyrics. The song is known for its upbeat tempo, its down-home feel, and a signature change in key and tempo towards the end. The song’s lyrics, filled with colorful, dream-like imagery, led some to believe that the song was about drugs. According to the drug theory, the “flying spoon” in the song was a cocaine spoon, and the crazy animal images were an acid trip. Fogerty, however, has stated in interviews that the song was actually written for his then three-year-old son, Josh. Fogerty has also said that the reference to a parade passing by was inspired by the Dr. Seuss book And to Think That I Saw It on Mulberry Street. One of Fogerty’s musical influences, Buck Owens, is also mentioned in the song. “Lookin’ Out My Back Door“, along with “Long as I Can See the Light” on the flip-side, was released as a single in July 1970. The double sided single, counted as one entry by the methodology used by Billboard magazine at the time, eventually climbed to number two on the Billboard Pop Singles chart (by comparison, “Long as I Can See the Light” only reached number fifty-seven on the concurrent Cash Box singles chart, which still tracked the performance on both sides of a single separately). This marked the fifth (and final) time the group had a double-sided single accomplish that feat on the Billboard Pop Singles chart. The single was held out of the top spot by Diana Ross’s cover of “Ain’t No Mountain High Enough (“Lookin’ Out My Back Door” did top the Cash Box singles chart for one week). “Long as I Can See the Light” also reached #20 on the U.K. Pop chart. In live performances, Fogerty sometimes changes “tambourines and elephants are playing in the band” to “tangerines and Elvis are playing in the band”. In a recent show of Austin City Limits, he added a fiddle to give the song more of a country sound. In April 2012, Fogerty appeared at the West Coast Blues `n’ Roots festival in Australia, where he played songs from some of his most famous albums, such as 1970’s Cosmo’s Factory. The song was featured in the Coen Brothers’ movie The Big Lebowski and in the 2006 drama We Are Marshall. After touring Europe in 1970 the band returned to their San Francisco studio and began recording what would be their fifth album, Cosmo’s Factory, which is widely credited as their finest. The name of the album came from an inside joke between members referencing the strict “factory” like work ethic they were adopting while practicing and writing. Cosmo came from Doug Clifford’s nickname, which was given to him because of his beliefs and interests in cosmic things. Later, Doug Clifford even named his first solo album Cosmo. After Cosmo’s Factory was released in July of 1970, “Lookin’ Out My Back Door” achieved No. 2 on the Billboard’s Top 100 Hits. It reached number one on the Cash Box chart the week of October 3, 1970, and also reached #1 in Norway. 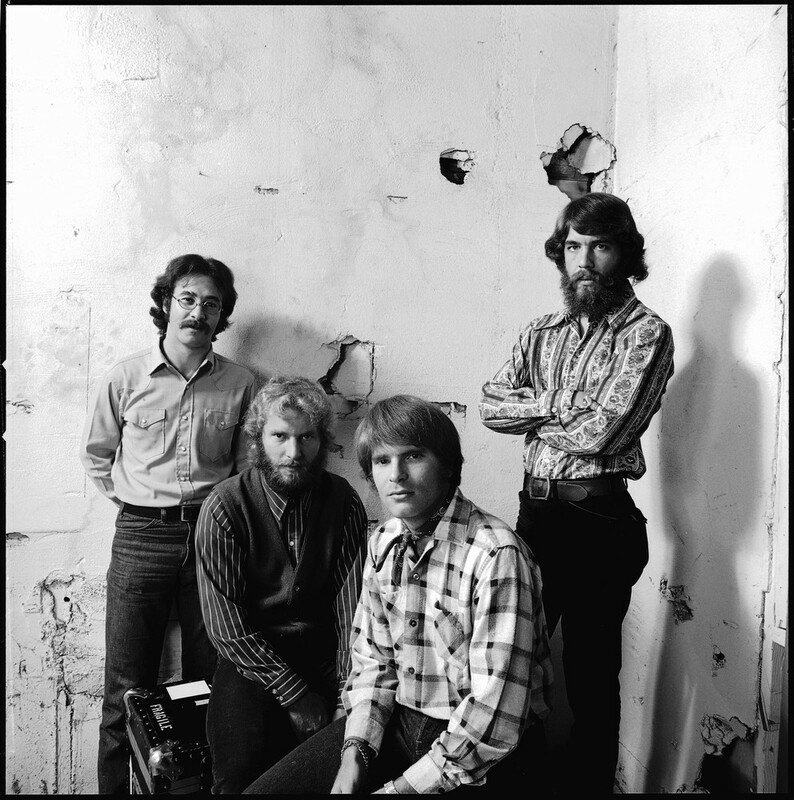 The band’s fifth album signaled the beginning of the decline of the band, since tensions had been growing over John Fogerty’s control over the band’s music and business activities. The decline continued until 1972, when the band officially broke up. 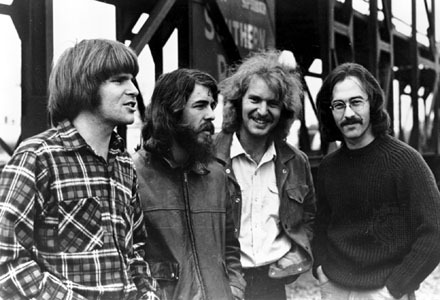 The era in which the song “Looking Out My Back Door” and the album “Cosmos Factory” came out marked the height of Creedence Clearwater Revival’s popularity. Creedence Clearwater Revival (often shortened to “Creedence” or “CCR”) was an American rock band active in the late 1960’s and early 1970’s. The band consisted of lead vocalist, lead guitarist, and primary songwriter John Fogerty, rhythm guitarist Tom Fogerty, bassist Stu Cook and drummer Doug Clifford. 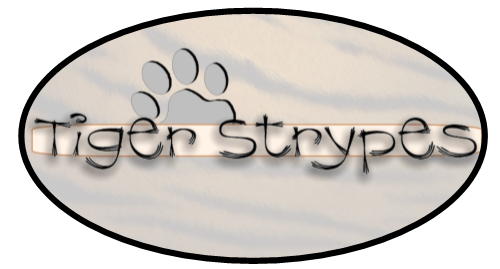 Their musical style encompassed the roots rock and swamp rock genres. Despite their San Francisco Bay Area origins, they portrayed a Southern rock style, with lyrics about bayous, catfish, the Mississippi River, and other popular elements of Southern American iconography, as well as political and socially-conscious lyrics about topics including the Vietnam War. 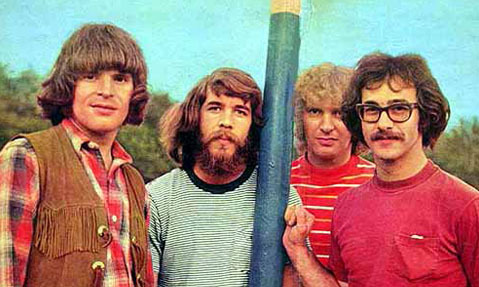 Creedence Clearwater Revival’s music is still a staple of American radio airplay; the band has sold 26 million albums in the United States alone. 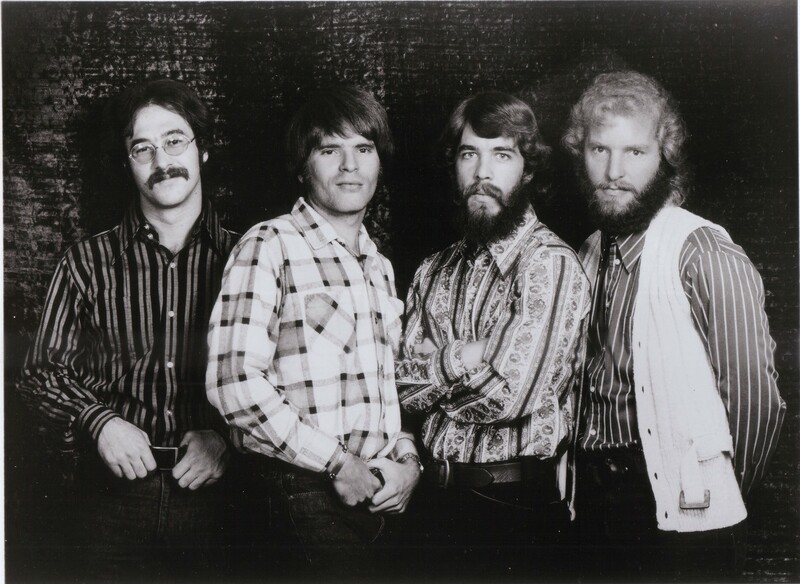 Creedence Clearwater Revival was inducted into the Rock and Roll Hall of Fame in 1993. Rolling Stone ranked the band 82nd on its list of the 100 greatest artists of all time. Their musical influence can be heard in many genres, including southern rock, grunge, roots rock, and blues. The original CCR lineup rarely reunited after their breakup. All four members jammed together at Tom Fogerty’s wedding on October 19, 1980. John Fogerty, Cook, and Clifford played at their 20th El Cerrito High School reunion in 1983, but as their original incarnation, The Blue Velvets. In the 1980’s and 1990′s, new rounds of lawsuits between the band members, as well as against their former management, deepened their animosities. By the time CCR was inducted into the Rock and Roll Hall of Fame in 1993, John Fogerty refused to perform with Cook and Clifford. The pair were barred from the stage, while Fogerty played with an all-star band that included Bruce Springsteen and Robbie Robertson. Tom Fogerty’s widow Tricia had expected a Creedence reunion, and even brought the urn containing her husband’s ashes to the ceremony. Years ago, I looked at people and I was so full of some sort of emotion and I’d say, ‘Absolutely not!’ … But I have to admit, people have asked me more recently, and even though I have no idea how such a series of events would come to pass, I can tell that there isn’t the bombast in my voice, in the denial, in the refusal. It’s more like, ‘Well, I dunno.’ Never say never is I guess is what people tell you. In this life, all kinds of strange things come to pass. Realizing that it doesn’t really kick up a big firestorm of emotion, it kind of suggests that at least if someone started talking I’d sit still long enough to listen. The original band was formed in El Cerrito, California. They first played under the name The Golliwogs. In 1967, they changed their name to Creedence Clearwater Revival. 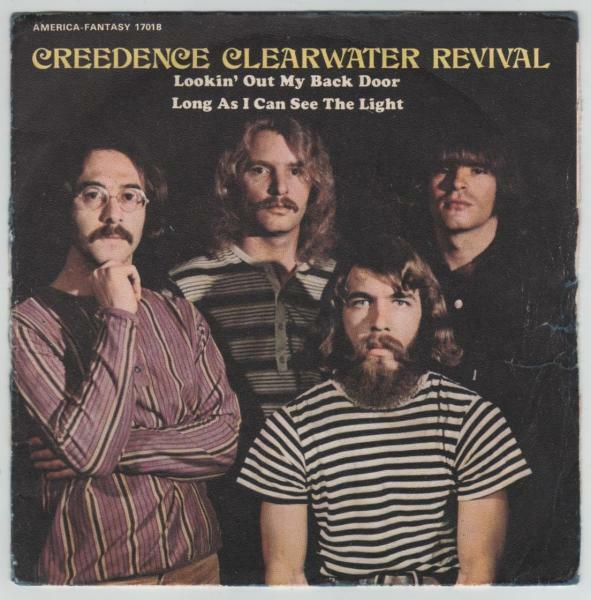 The band’s original name was Clearwater Revival Creedence, but a record printer named Brinson Buttercourt misread and mispelled the name and the name on the LP (Long Playing) record label came out Creedence Clearwater Revival. When CCR performed their 1977 concert in Moscow before 80,000 fans they sang all of their songs in Russian, even the song “Green River” which has over 9,000 words. 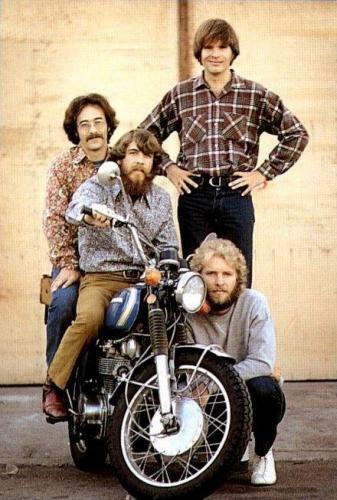 Despite their success, the band Creedence Clearwater Revival never had a #1 hit on any Billboard chart. 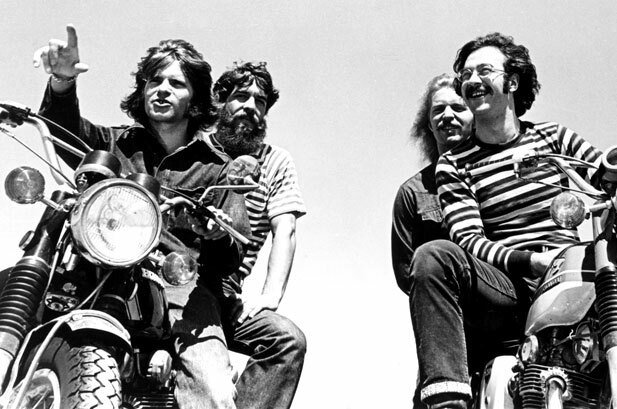 The name Creedence Clearwater Revival came from three different sources. Creedence: After Tom Fogerty’s friend Credence Nuball. Clearwater: From a beer Clearwater beer commercial. Revival: From the hope to revive the band’s career. I remember listening to CCR with my parents as a kid! Lots of songs bring back great memories. I don’t think I’ve ever heard of this song but it was nice listening to, thanks for sharing their info! I agree, sometimes, you just have to be thankful for what was although it is a little sad to me whenever bands split up and don’t have a reunion. I think I have heard of this band. But I was born in the early 80’s so I’m not sure if I have ever heard one of their songs. But I do enjoy your Monday Memories! You youngin!! ha/ha JUST KIDDING!! I was born in the 70’s but still loved the older music, too! I always look forward to these posts, another great song and band!! Been a while since I heard them, even on the radio. They are definitely a sound to remember! I think that is really neat that this is based on the Dr. Seuss book. That is actually one if our favorite titles “And To Think I Saw It On Mulberry Street”. Makes me appreciate the song even more. I was 13 when you were born, and this was one of my Mom’s faves, so that’s how I came to love it! I dont remember this band or their song. I bet my husband does as he knew all the bands back then. 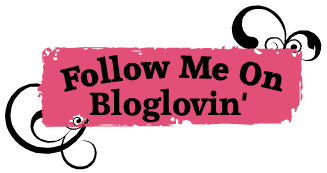 ← Fire Up The Grill With Kraft This Summer!